We have an extensive online catalog which includes, but is not limited to: T-shirts, sweatshirts, polos, denim shirts, jackets, towels, aprons, baby blankets. At Levelbest, We're proud to offer you the finest quality line of cotton and cotton / polyester blend knit, woven, and denim shirts manufactured by leading apparel companies. 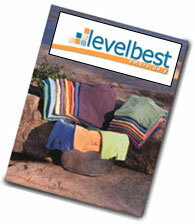 We also offer a printed version of the full color catalog. If you are interested in receiving one via mail, please fill out our quote/catalog request form or call us and one will be sent to you shortly. > Start Browsing The Catalog Now!